How big are log exports from BC? Here are further details of the value of log exports to the BC forest industry and economy. Raw log exports from British Columbia – Between 2013 and 2016, according to some reports, log export volumes from BC were close to 26 million cubic metres worth an estimated $3 billion. 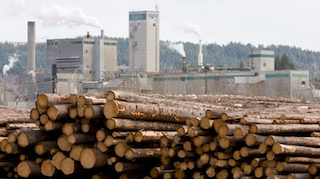 In BC logs are required by law to be manufactured domestically, but there are exceptions. Raw logs are subject to a "surplus test," where loggers must first advertise logs to the domestic market. If there are no fair offers, the logs can then be sold and shipped overseas. In parts of the province where there are few or no processing plants, raw logs don't have to be offered to local industry. Horgan says the province is looking to develop higher standards that will encourage more processing in B.C. Those will roll out over the next two years following consultations with First Nations and industry stakeholders. The premier says it could mean increased fees for log exporters in certain regions, as early as the summer of 2019.